In the previous article we looked at the old-school VBS scripts that can be used to manage printers and print operation in all Windows versions, starting from Windows XP. Today we are going to consider typical commands to install, manage and remove printers, print ports, drivers and queues using PowerShell. 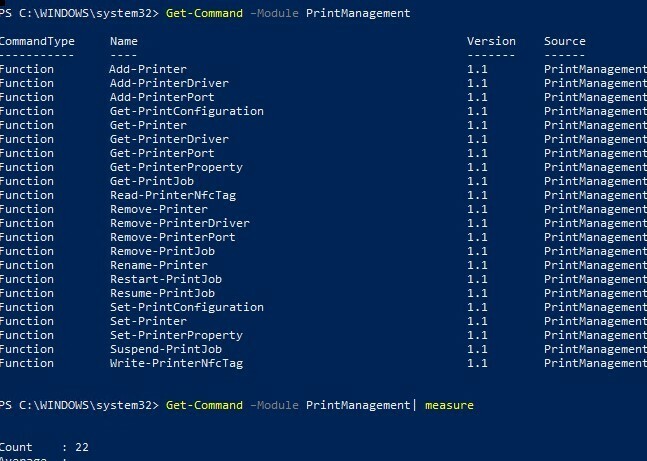 These ways of managing printers from PowerShell CLI can be used in modern operating systems – Windows 10 / 8.1 and Windows Server 2019 / 2016 / 2012 R2. How to Install Printer Using PowerShell? How to Remove a Printer Using PowerShell? Write-PrinterNfcTag – write information into the NFC tag. Let’s look at a few examples of typical printer management tasks using PowerShell in Windows 10. Add-PrinterDriver -Name "HP Universal Printing PCL 6" -InfPath "C:\Distr\HP-pcl6-x64\hpcu118u.inf"
the cmdlet Add-WindowsDriver that allows to integrate drivers into the offline Windows image. Add-PrinterDriver -Name "HP Universal Printing PCL 6"
Tip. How to find out what should you specify in the field of the print driver name when installing the driver via PowerShell? The specified print driver name must exactly match its internal system name, otherwise an error will appear during the driver installation. You can find out the correct driver name using the get-printerdriver command on a computer where this print driver is already installed, or by manually examining the driver’s .inf file. Add-PrinterPort -Name "IP_192.168.10.26" -PrinterHostAddress "192.168.10.26"
Add-PrinterPort -name $portName -PrinterHostAddress "192.168.10.26"
Note: Note that to perform the same operation (install and share a printer) using VBS scripts (Printing Admin scripts), you should perform two different commands. 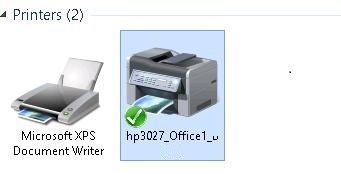 After running these commands, a new shared printer with the name “hp3027_Office1” will appear in the system. Rename-Printer -Name "hp3027_1_Buh" -NewName "hp3027_F1_Salary"
As you can see, the command shows the printer name, type (local or network), driver, print port, whether the printer is shared and published in the Active Directory. Most PrintManagement cmdlets can be used to view status and manage printers, drivers and print queues on remote computers (print servers). The name of the remote computer or server is specified as an argument of the –ComputerName parameter. Remove-PrinterDriver -Name "HP Universal Printing PCL 6"
This post was very helpful since you explained that the driver has to be in the driver store to install the driver and how to put it there. I have been able to duplicate this process but we also install the 32 bit driver on our servers so I am trying to figure out the command for the install of that driver. I run the pnputil.exe command to add the 32 bit driver and I do not get any errors and when I run the Get-PrintDriver I see the PrinterEnviroment listed so I am using the command below to try to add the printer but it fails. Am I missing something? The x64 driver is added but the x86 fails. I am doing this locally on the server. This post helped me figure out the x64 drivers, thank you much for this post. no luck i spent hours to search how put x86 driver in my print server with command line (prefered powershell) .. but no luck ..found nothing .. only gui way ..
hope some have an answer. Perhaps you have figured out a problem i have spent all day on. What if you dont know the name of the driver? sure i know where the INF file is and i can open it in notpad ++ and find the name but what if it is cryptic or you are automating the process so clicking the INF you want to install will require a driver name. Add-PrinterDriver -ComputerName $server -Name ???? I can pint to the INF file but that does no good. Perhaps there is a way to do it. I hope. Powershell or batch. They will not work against windows 2003 servers? add-printer : The specified print processor is invalid. This helped tremendously. Thanks for sharing.